I have been greatly intrigued with the many pictures and accounts of the 1906 Handcross Hill runaway bus disaster. The pictures of the 3000 people turning out for the funeral at Orpington are amazing. This has reminded me of a gravestone at St Mary’s church in Slaugham of an early French driver. Perhaps he had arrived in Sussex with an imported French car. His grave is located just to the left of the path leading to the Mill Pond. At the top of the stone is written “A l’ami regrette”, “A friend is sorry”. It continues “Henri Michelaud. Tué en automobile le 26 Octobre 1902. Age de 26 ans. In 1902 a “chauffeur” in French would probably translate better as a “driver” in English. The French word was adopted by the British to describe a more specific type of employed driver usually of elegant passenger vehicles. The newspaper article on the 1906 bus accident on picture #866 has an account by Mr C. Godson (sic) (probably should be Gadsdon) of Crawley Motor Works in the right-hand column about halfway down. He reports “There was a motoring accident several years ago on Handcross Hill, a man being killed”. 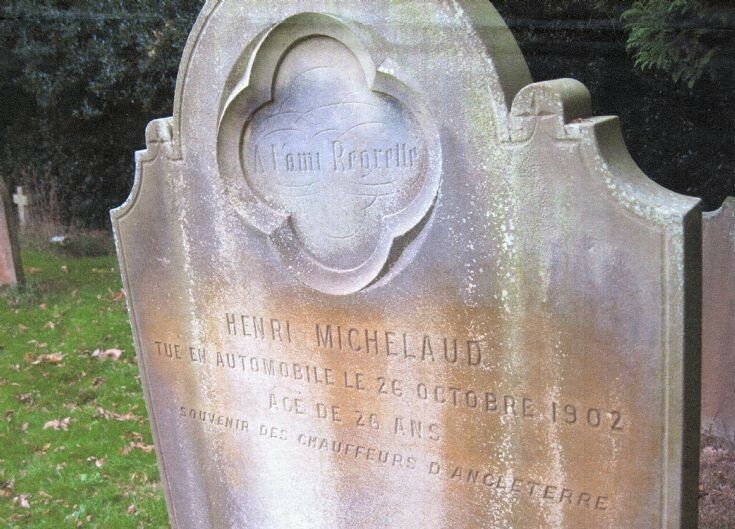 It seems most likely that he was referring to the regrettably death of M. Henri Michelaud. I came upon the following press agency report from London in the Sydney Morning Herald dated 15th November 1954. "A passenger in a 52-year-old car was killed during the annual London to Brighton rally of veteran cars yesterday. He was Mr George Reid of Selkirk, Scotland, a passenger in a Panhard Levassor, a 24 horsepower car, built in 1902. At the village of Handcross, about two-thirds of the way to Brighton, the Panhard and a modern car collided. Club officials believe this is the first fatal accident in the long history of the rally which commemorates the day, 58 years ago, when British motorists were given the freedom of the roads. Until November 14, 1896, an owner was compelled to employ a lookout man to walk in front of his car. A fantastic Edwardian cavalcade of more than 200 ancient cars snorted and chuffed their way from London to Brighton yesterday." George Reid was my grandfather. Sadly due to this tragic accident I never knew him. He was actually from Camelon near Falkirk. Selkirk is a typo. He must have been a very interesting man. He was awarded a BEM for Service to Aviation during WW2 when he was seconded to Hawker Sidley.